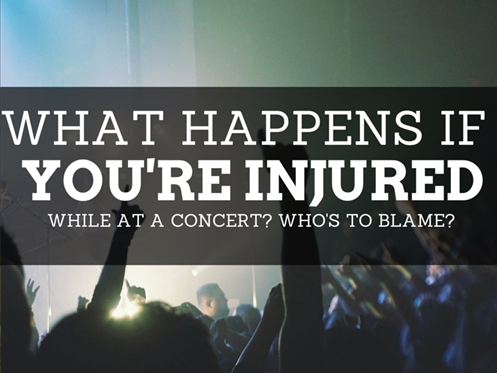 What happens if you’re injured while at a concert? Concerts usually have security to help provide a safe environment for everyone that’s looking to enjoy some great music, but what happens if you’re somehow injured while at a concert? Is there anyone that is liable? Here are a few considerations to determine if you should file a claim. - Are your injuries serious? Do you feel like you sustained a pretty serious injury? - Was medical care needed in anyway? - What about a trip to the hospital? - How were your injuries sustained? - Was it a lack of safety? Maybe there wasn't enough security? Consultations are generally free and you can get a better idea of what kind of recourse there is regarding your injury. Concert injuries can be complex. With that being said, you really don’t know what to do or what step to take next without getting in touch with a personal injury lawyer first. There have been plenty of examples of serious injuries being sustained by concertgoers. The best thing you can do is consult with an attorney. Doing so can help you tremendously.